Ergonomic disaster. This guy is an example of what not to do: Slouching. Leaning. Eyes glued to the monitor. Fingers cramped. Stressed. Fatigued. Looks like he could use a healthy dose of ergonomics in his life. Ergonomics is a way of designing a person’s environment to foster the highest level of function. 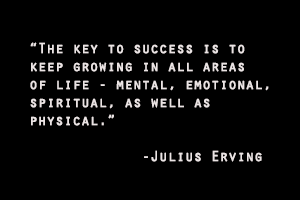 It looks at what type of work you do, the tools you use, and the whole environment in order to find the best fit for you, considering the above factors. Good ergonomics promotes increased work productivity and quality by preventing injury and promoting increased health, safety and comfort. Let’s take a look at 7 principles that will keep you working efficiently and sprightly for the long haul (and prevent you from visiting the worker’s comp. department). 1.) Follow the 90-90 rule! Position your elbows, hips, knees, and ankles in a 90 degree position for optimal alignment. 2.) Keep your feet flat on the floor so that it distributes your weight evenly. Dangling feet cause pressure on the legs, making other body parts compensate. Use a footrest if your feet do not reach the floor. 3.) Choose a good chair and make sure your rear is positioned all the way to the back. The back of your knees should be two finger-widths apart from the seat’s edge. 4.) Keep your wrists straight, relaxed and in a neutral position in line with your forearm. When typing, the best practice is to keep your wrists floating rather than resting them on a wrist pad. But if you choose to use a wrist pad, rest the heels of your palms and not your palms. If possible, use the wrist pad between typing movements and not during typing. 5.) 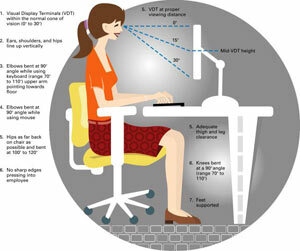 Position the top of your computer screen at eye level to prevent eye and neck strain. 6.) Look away from computer screen frequently to allow muscles inside the eyes to relax. Focus on items that are away from you in 5 feet increments up to 20 feet for about 1 minute. Blink your eyes rapidly to refresh tear film and clear dust. Another tip: Look at the color green to soothe eyes. Studies have shown that the color green is calming for the eyes. 7.) Perform back, shoulder, and wrist stretches and shoulder shrugs at least every hour to prevent body strain and stress. And do not be afraid to speak to your employer if the office ergonomics are less than ideal or non-existent. You’re entitled to be comfortable at work and if you need an adjustable monitor arm, a suitable desk or chair or something else to stop you experiencing pain whilst working, ask for it. What makes more sense; investing in ergonomic furniture or having an unhappy, uncomfortable workforce that is often off sick through back pain or RSI?